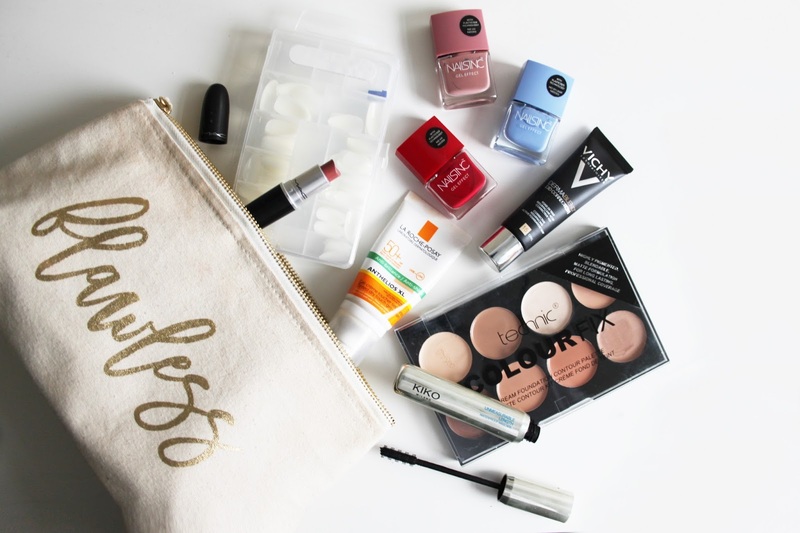 What would the end of the year be without a beauty round up? Until recently I used to do these on a monthly basis, but as we all know I’m no good at sticking to ‘series’ style posts and fail miserably after a few months, so a yearly post is more my style! This year I’ve discovered lots of new products that have become firm favourites in my routine, but there’s also a few old favourites in here that have stuck around since previous years too. 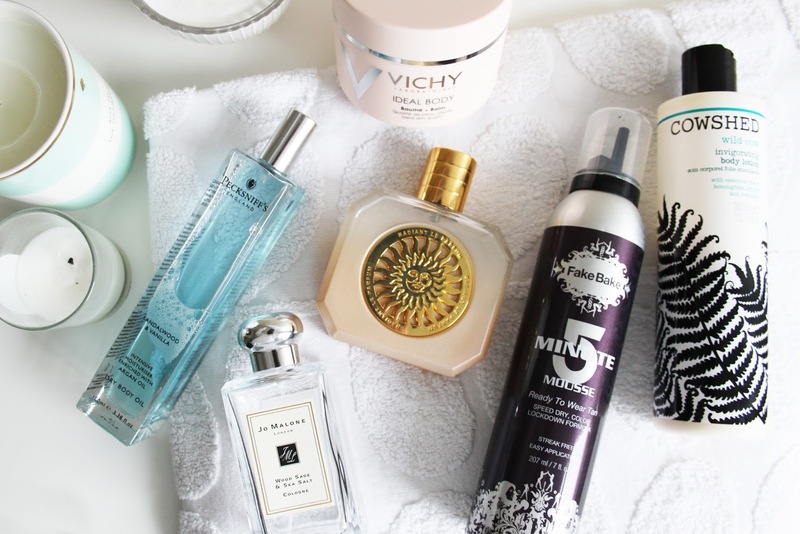 Here’s my selection of all my favourites from the worlds of beauty, skincare and haircare! This year my love has continued to grow for the Vichy Dermablend 3D Correction foundation, and it’s been my base of choice for pretty much every day. I’ve repurchased Vichy foundations countless times as they’re the only ones that don’t screw up my problematic skin, and it’s looking likely that this one will be my firm favourite for the foreseeable future. For those wondering, I wear the shade Opal, but sometimes this can be a little pale for me (plus it doesn’t contain SPF) so I add a pump of the La Roche-Posay Anthelios XL 50+ tinted SPF for protection and a warmer colour – this tube is still going strong since it’s arrival back in June! Also new to my collection this year is the Technic Colour Fix Cream Contour Palette. This palette is a dream and cheap as chips, coming in at under £4 for six great shades. Naturally I use the palest shades the most for concealing and highlighting, but also the darker colours for contouring. I use this so much that I’m on my second palette! Other items I’ve been loving this year are the KIKO Unmeasurable Length Waterproof Mascara which is one of the best mascaras I’ve ever tried (plus I can sob as much as I like and it really doesn’t budge!) and of course MAC lipstick in my old favourite, Patisserie. I must be on my sixth or seventh tube of these. One word – obsessed! When it comes to nails, I’ve got really in to press on falsies this year, most specifically Elegant Touch Totally Bare nails in stiletto and oval shapes, perfect for painting with my favourite polishes, which this year have to be the Nails Inc Gel Effect range – I couldn’t pick a favourite so I thought I’d include three! Another honourable mention that looks a little worse for wear since all the branding has rubbed off (too ugly to photograph now!) is the Maybelline Brow Satin – my absolute favourite brow pencil – dare I say even more so than the Anastasia Brow Wiz!? This year I’ve kind of scraped my skincare routine back to the absolute bare minimum, and it’s done my skin the world of good. I used to constantly flip from product to product based on the hype surrounding them rather than really considering if they would be good for my combination skin. 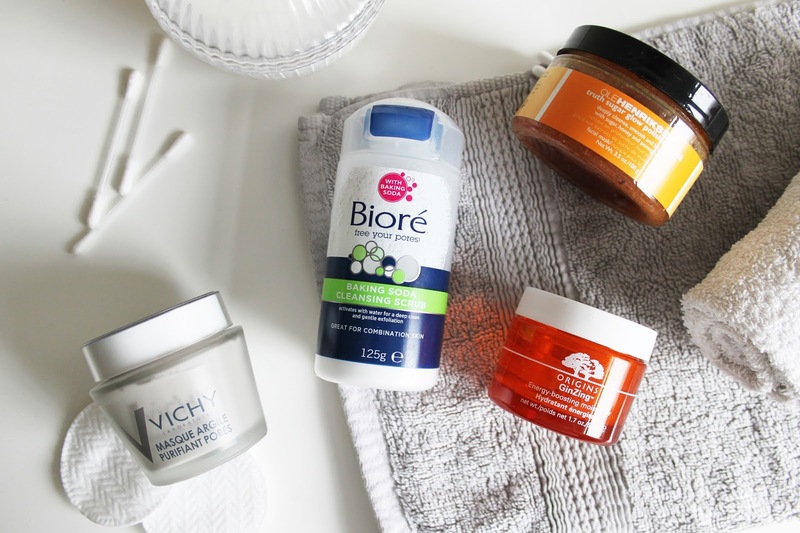 I decided to stick more or less to one product, and its now my absolute holy grail skincare product – the Biore Baking Soda Cleansing Scrub (thanks to my gorgeous gal pal Sophia for recommending this to me!) – this is by far the best skincare product I’ve ever used, and probably the weirdest, but omg it’s good. I wouldn’t recommend it if your skin is dry, but if you suffer from oil prone skin like me then definitely give this one a go. I rarely use a moisturiser after this as I personally don’t feel like I need it, but when I feel like giving me skin an extra treat I reach for my old favourite, the Origins GinZing Moisturiser which I’ve loved for years. When I want to truly pamper my skin I go for one of two masks – if its the morning and my skin needs a pick-me-up after a long week, I go for the Ole Henriksen Truth Sugar Glow Polish. I love this as it really perks up dull skin, smells incredible and can easily be used in the shower first thing in the morning. If I want to wind down in the evening I go for the Vichy Purifying Clay Mask that is a real calming treat after taking off my make up. Both work wonders for my skin, so I couldn’t choose between the two! On to the body products! I must admit I’m absolutely pants at remembering to look after my skin, so I don’t use body lotions and moisturisers anywhere near enough as I should, but there’s a couple of products that I adore and (almost) always remember to use after a shower or bath. For a quick fix that I used most in Summer, I love spritzing my legs with the Pecksniff’s Sandalwood & Vanilla Dry Body Oil as it gives them a lovely sheen and smells incredible! When I want more of a luxurious thick moisturiser, there are two that I reach for. If I’m in a hurry and need to dress quickly, I go for the Vichy Ideal Body Balm as it dries really quickly and doesn’t leave any residue on clothes, but when I have more time on my hands or want to pamper my skin before bed time I go for Cowshed’s Wild Cow Invigorating Body Lotion which has a lovely relaxing scent of lemongrass, ginger and rosemary. Also in the body care section is my absolute favourite fake tan which is the Fake Bake 5 Minute Mousse – my go to for any special occasions or nights out as it dries super quickly and doesn’t require any of the ‘do it the day before and then shower off’ malarkey – I can apply it right before I get ready and I’m good to go! Finally, not sure if they are classed as body products but I didn’t know where else to put them, but perfumes! There have been two stand-out scents for me this year and both very different. The Fragrance Shop’s Radiant Eau De Parfum – a dupe for Estee Lauder Bronze Goddess which just oozes with coconut-y summer-y goodness, and Jo Malone Wood Sage & Sea Salt – my favourite of all time. You probably all know what this one smells like so I won’t go in to detail but it’s so calming, fresh and heavenly! Okay, so there’s quite a bit of haircare to get through here, but I feel like I’ve finally got to grips with my hair over the past 6 months or so after having a serious love hate relationship with it. I now love the colour, I’m happy with the length and I’ve resigned myself to the fact that I’m just not meant to have long luscious locks, so instead I’ma work with what I’ve got! First up I’ve been seriously loving the Hair Xpertise Argan Blonde Silverising Shampoo & Conditioner for keeping my blonde ombre the colour I want it to be, and stopping it from going brassy and yellow. I’ve also loved using the Palmer’s Coconut Oil Formula Reparing Conditioner every other wash, as silverising products can be quite drying when used a lot. This keeps my hair looking healthy and is a god send when it’s gone through so much bleaching at the ends! I also occasionally love to use the Percy & Reed Foaming Treatment Mask when my hair is lacking life, and this ensures its back to looking its best in no time! Finally, on to styling! You know me, I tend to wear my hair in many different styles, but mainly either straight or in loose messy curls. When I’m straightening my hair, I want volume as it tends to be quite flat, so I use Moroccan Oil Root Boost before blow drying to give lift at the roots, then once straightened, I tip my head upside down and spray a little of Superdrug’s Style Expertise Texturising Back Comb Spray in to the roots before teasing everything in to place. 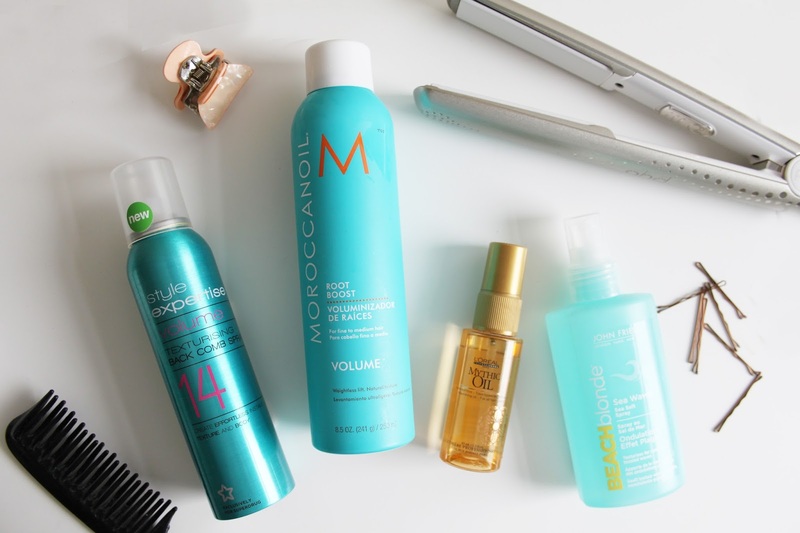 These are the only things I use for when I wear my hair straight – any more and it would completely weigh my hair down what with it being so fine! For curly hair, I spray a little John Frieda Beach Blonde Sea Waves Sea Salt Spray through the lengths of my hair before drying to add texture, then I get to styling with my curling wand. Once done I reach for L’Oreal Mythic Oil and run a couple of pumps through the ends of my hair whilst pulling apart some of the curls to make sure it looks lovely and glossy! 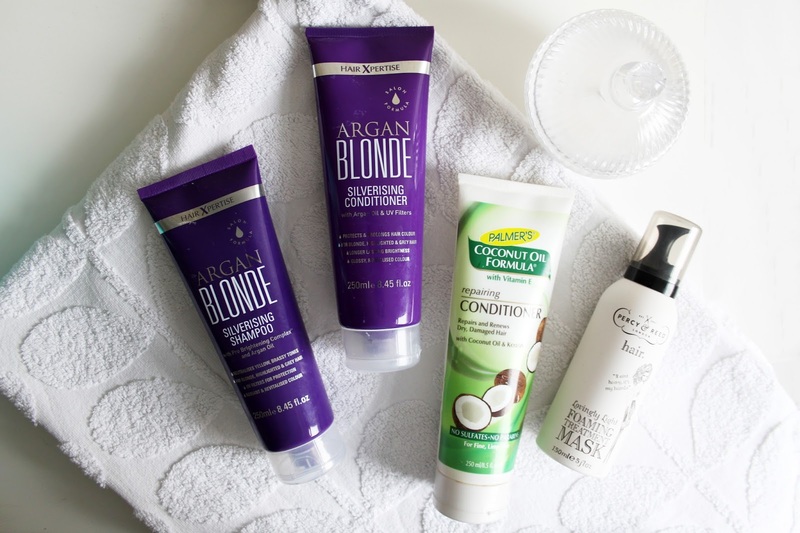 All of these products are firm favourites of mine and I very rarely stray from them to try anything else as I’m so fussy with my hair! Phew – that was a lot! What are your favourites from the past year? That’s pretty much it from me for 2016 now, but just a quick soppy few words to say thank you to everyone who has stuck with me this year, through the name change (so long, Sitting Pretty!) and sporadic posting, and to any new readers who have joined along the way! It means the world to know that you like the stuff I write and the pictures I take, and makes all the work worthwhile! Have a blast this New Year, and see you on the flip side. Bring on 2017!! "A YEAR IN OUTFITS: 2016"